OLD PARKED CARS. 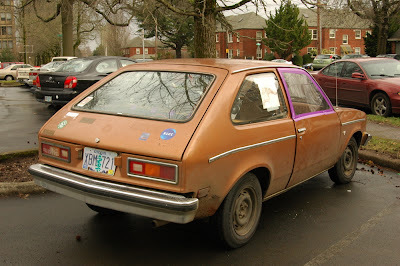 : 1979 Chevrolet Chevette Hatchback. i see this car in a trade school parking lot, which leads me to speculate that the owner is a teenage hot-rodder. i held off posting these photos, which were taken in early march, thinking i'd find better lighting another day, but last week i saw the original paint replaced with all-new primer. turns out, i like the lighting after all, quite a lot even. i'll keep tabs on the restoration project. watch for the update. 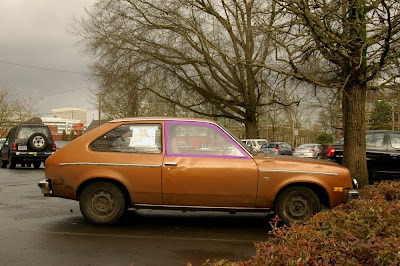 In Europe this same car is known as Opel (mainland) or Vauxhall Chevette (in UK). This is actually a 1979 model. 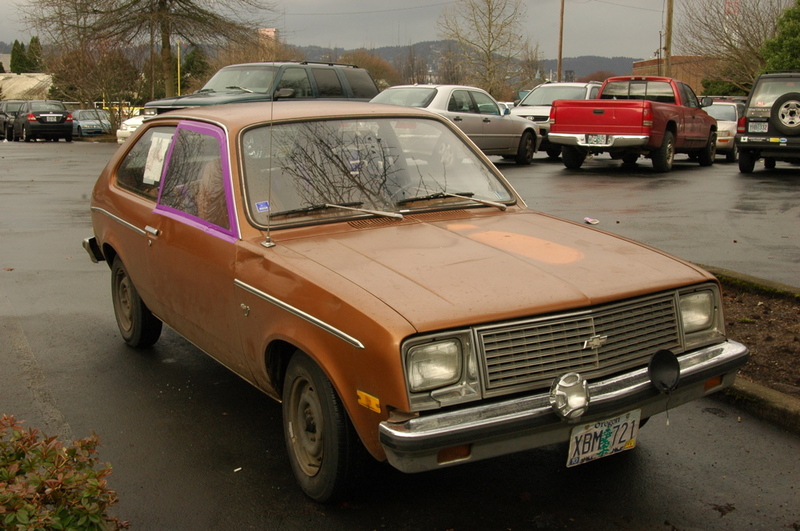 Chevy revised the front end in 1979, and added larger wraparound taillights in 1980.
awesome. thanks for the tip, mike. Had a '78 Chevette, but a 4 door. Great dog hauling car. Looked a lot like your photo (grill/rear/body). I am looking forward to restoration photos, as you track it! Well I never expected my car to garnish this much attention. My name is Zane and I am the cars lovely companion. :) I studied in the automotive dept. at Benson and graduated in 2012. The primer was the beginning of the biggest mistake I ever made with that car: Painting it Semi-Flat black... (go on gasp I know you want to) I must say that currently I am much happier with the car these days. We had some rough times together for sure. Major changes that it underwent included the brakes in 2011 when this picture was taken, and more recently a top end rebuild in July of last year. Now here is for the fun tidbit: In 2009 we made a mock commercial for it, hope you enjoy. Yes, the kid with the purple hair is me. I've always liked the '79s the most because they have the newer style grille with the older style tail lights.